Okorogheye Orisheneye, a 15-year-old Nigerian teenager from Delta State has emerged victorious after an outstanding performance in WAEC and JAMB. 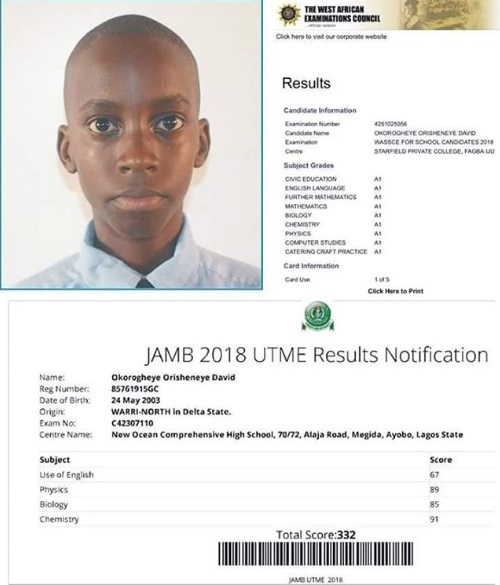 The boy who has become a hot topic on social media reportedly got straight As in all the nine subjects he registered for in the 2018 West African Examination Council (WAEC), after sitting for the exam in Lagos state. He also aced his JAMB exam with a total score of 332.